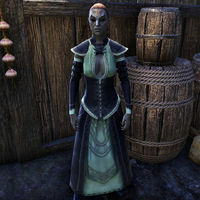 Ienasa Telvanni is a Dunmer alchemist who can be found at her store, Alchemical Solutions, in Vivec City. If engaged in conversation, she will say: "If you must be told the basics, then you're simply not ready to purchase from my shop. Look elsewhere for someone to hold your hand. A mistake in alchemy is the difference between life and death. Will you be needing anything today? ", "You will not believe how close this stand has gotten to blowing up. Perhaps fools are soon parted from their gold, but I would rather they avoid my shop altogether. What can I help you with today? ", "If you're looking for suggestions, then look elsewhere. I sell to those who know what they need, when they need it. Alchemy is not a trade for the indecisive. What will you be purchasing today? ", or "The store of alchemy is a time-honored tradition, passed down from generation to generation. So I expect no silliness here, understood? Now, what are you in need of?" This page was last modified on 7 January 2018, at 19:56.